The Harkens grave is located on the east side of Highway 115, about 5.8 miles south of the main entrance to Fort Carson, southwest of Colorado Springs. 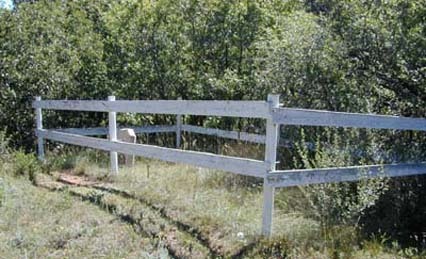 Visible from the road, it is ringed by a white fence set on a small rise and crowded by scrub oak. According to GPS-derived geolocation (accurate to within 10 meters), the marker's coordinates are latitude 38°40'16.3"N and longitude 104°51'30.2"W. The original marker has been embedded in a larger tombstone-shaped concrete marker. Faint lines from the original inscription are visible but not genuinely legible on the lichen-covered stone. In 1939, the Colorado Springs Gazette published an interview with Henry Priest, who was a boy when he helped bury the murdered Henry Harkens (January 22, section 2, page 8). Harkens was about 55 when he moved to what later came to be known as Deadman Canyon. Priest had previously known him in Buckskin, Colo. Harkens and his partners Alden Bassett, McPherson, and Judd had bought a sawmill in Cañon City and were moving it to the canyon. Harkens was building a cabin there, and he welcomed the Priest family when they moved nearby on March 12, 1863. The bandits were eventually tracked to Espinosa Peak, near Cripple Creek. The older one was killed, but the younger brother escaped. In addition to Harkens's glasses and personal items from other victims, the elder brother was said to have had a document on his person pledging to kill 600 whites in revenge for the loss of their money and property during the Mexican war. The younger Espinosa reportedly returned to Mexico, recruited a 12-year-old nephew, and returned to his quest. Both were killed near Fort Garland, Colo., by a marksman who received reward money put up by the state. A September 3, 1947, Gazette Telegraph newspaper article ("Graves of Pioneers Moved to Make Way for New Road, by C.S. Dudley, page 1) found in the Harkens file at Colorado College Tutt Library Special Collections reports that the burial site contains other burials and that the cemetery was moved on September 3, 1947, to its current site, about a quarter mile closer to Colorado Springs than its original site. The graves were moved under the direction of Harry Blunt of Blunt Mortuary. 1. Henry Priest, who died in the "1830s" (sic, 1930s? ; he was alive on January 22, 1939) at the El Paso County poor farm and who asked to be buried beside his "old friend" Henry Harkens. In 1947, the "the name has been washed off of a marker over the Priest grave by rains." 2. Child Bennie Legg, who died of typhoid fever in the 1890s. He was son of Ben Legg, who then owned the ranch that included the cemetery. In 1947, only a little red sandstone headstone without an incription marked the grave. 3. Child Mildred Price, who died before Dingel arrived in the region in 1884. A daughter of a nearby rancher, she drowned by falling face down in water in a dairy building. "Some say it was a boy," Dingel said. "But I have heard that this was Mildred Price's grave." Her grave was then also marked only by a red standstone headstone without an inscription. 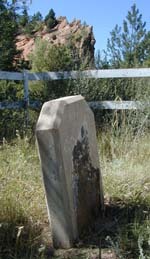 According to the 1947 article, the state highway department had the new concrete tombstone made in which the old one for Henry Harkens is embedded. Note: the 1947 newspaper article cited is likely from the evening edition of the Gazette-Telegraph, but that hasn't been verified. It's not from the morning edition, but Dudley, the reporter, was a Gazette-Telegraph reporter, per the city directories. 1902 photo of Henry Harkens tombstone courtesy Special Collections, Tutt Library, Colorado College, Colorado Springs; used with permission.